I grew up having heaps of books around me, so it took me a while to decided what to do for these nails. Annnd when I did them, I didn't like them, so I chose something completely different and did them again. So, introducing my Scarface Claw nails. Whenever I see them I keep hearing "Scarface Claw, the toughest Tom in town" in my head. 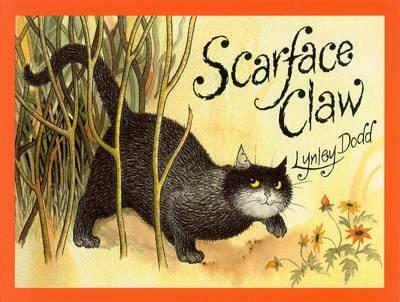 Scarface Claw is part of the Hairy Maclary series for those who don't know, which are very popular children's books by Lynley Dodd. His face ended up looking a little/completely weird. Oh well. I guess I like these nails. I didn't have them on long enough to really appreciate them due to the whole being is hospital blah blah blah thing, but hopefully things will be back to normal soon and I have have painted nails on for at LEAST a couple of days and on both hands. The writing was a bit of a challenge. I almost ran out of room but just managed to squeeze it in. Not much writing here, but it'll have to do! Looking forward to seeing what everyone else does! whoahhh~ you did a wonderful job here!!! Wow! This is incredible! Wow, just Wow! Hairy Maclary from Donaldson's diary. Hercules Morse, as big as a horse. Bottomley Potts, all covered in spots. Yep, there's my childhood just flooding right back to me!